Steel Authority of India Ltd. (SAIL), nation’s largest steelmaker and a ‘Maharatna’ public sector enterprise, has been Awarded with the prestigious SCOPE Award for Best Practices in Human Resource Management for 2014-15. 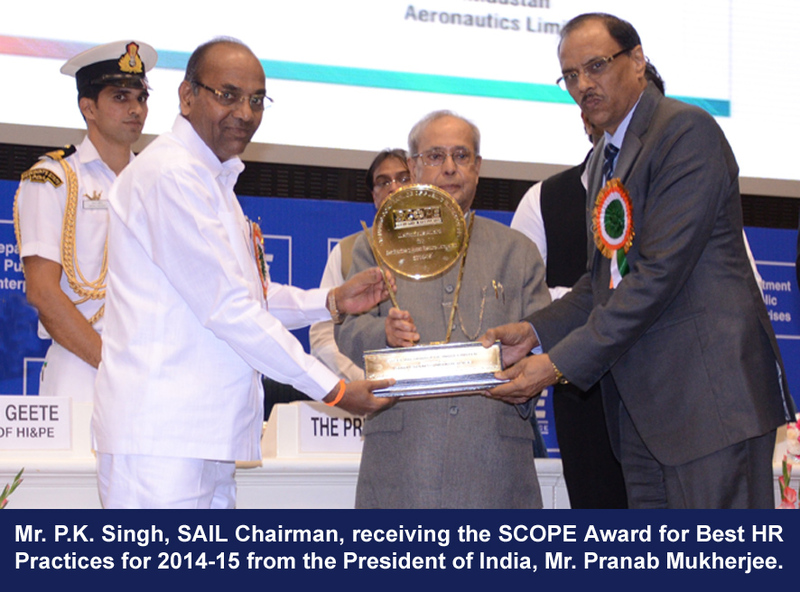 Mr. Pranab Mukherjee, President of India, presented the Award to Mr. P.K. Singh, SAIL Chairman, in the presence of Mr. Anant G. Geete, Minister of Heavy Industries & Public Enterprises, and Mr. Babul Supriyo, Minister of State for Heavy Industries & Public Enterprises. Earlier, SAIL was awarded in the same category for 2011-12. The Award was presented at the Public Sector Day function organized by SCOPE at Vigyan Bhawan recently. He also recognized the constructive and important role played by employee’s associations and unions in synergizing the company’s priorities among the wide workforce across the organization. This recognition is a reflection of the company’s special efforts to design highly motivational work environment and employee focused initiatives to nurture best in class talents. SAIL management has repeatedly emphasized on the value of human capital in providing the competitive advantage and identified the potential of a high performing team. The company believes in guiding organizations’ investments in people through things like leadership development, job design, and knowledge sharing through systematic & focused interventions and policy of Learning and Development. Employees are provided meaningful opportunities to acquire new knowledge through different types of workshops / programmes / competitions. ‘LEO’ (Learning from Each Other Workshops), skill knowledge transfer and collaboration with premier technical / management institutions, business simulation games, and flagship programmes such as Chairman’s Trophy for Young Managers are some of the benchmark practices. The company is also focusing on developing high impact leadership amongst its ranks to drive the top management’s agenda of ‘change’ and for transforming SAIL into a vibrant organization. SAIL recognizes the importance of internal communication for creating a shared vision across the organization. Towards this Chairman has so far interacted with cross section of more than 25,000 employees and at all plants various interactive programmes are organized at regular intervals with the CEO. New online Executive Performance Management System (EPMS) has been implemented with a view to reinforce a performance oriented culture. To prepare managers for assuming greater role and responsibilities in future, thrust has been given on succession planning for which SAIL has formed an Assessment and Development Centre (ADC).